FILE - An opposition fighter walks with his weapon in Akobo town, South Sudan, Jan. 21, 2018. South Sudan's warring parties are expected to sign a proposal drafted by Intergovernmental Authority on Development (IGAD) mediators that addresses many of the major sticking points that have prevented a peace deal. Delegates from the parties spent five days in intense negotiations in the Ethiopian capital, but had been unable to reach a consensus, which prompted the IGAD proposal. Government and opposition representatives, activists and observers Tuesday signed a document that recommits them to talks about governance issues, including implementing 35 percent affirmative action for women at all levels of government, acknowledging the need for all guns to fall silent, and respecting the cessation of hostilities agreement signed last December. 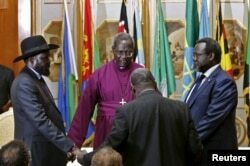 Church leaders had been leading this round of talks in Addis Ababa. Justine Badi, the archbishop of the Anglican Church of South Sudan, emerged from talks Tuesday to say the message to the delegates is simple. "South Sudan Council of Churches urges the parties to cooperate with one another in the spirit of compromise and with IGAD for the sake of the millions of suffering South Sudanese," Badi told South Sudan in Focus. Mabior Garang, who chairs the Communication Committee of the SPLM-In Opposition, told VOA, "We can be hopeful in the little progress we have made." The failure of the parties to reach a deal after several months of negotiations has been seen this week as a major disappointment by many South Sudanese and international observers. Clement Janda, a representative of South Sudanese refugees from Uganda, said the warring parties refuse to put the people first. FILE - Displaced people walk next to a razor wire fence at the United Nations base in the capital Juba, South Sudan, Jan. 19, 2016. "The issue of those of us suffering in the refugee camps and those in the IDP [internally displaced people] camps were never an issue in this forum. People are talking about dividing positions, but they are not talking about the suffering of the millions of people in the camps," Janda said. Jon Pen, a civil society activist delegate at the talks, said the lack of pressure from regional and international observers is one reason the parties have failed to sign a deal. He also said there are too many delegates at the talks. "The parties are too many and if there are too many the concessions will take too long to reach. Some of them, I can even describe them [as] nominal, they are not really active on [the] ground," Pen told South Sudan in Focus. Pen also thinks the principals of the warring parties — President Salva Kiir and rebel leader Riek Machar — need to be at the talks to tackle some of the toughest issues. When the parties failed to reach a deal Monday when the talks were scheduled to end, IGAD leaders presented delegates with a draft proposal on security and governance issues. The document, dubbed a "bridging proposal," follows shuttle diplomacy efforts by IGAD leaders over the last 11 months. FILE - South Sudan's rebel leader Riek Machar, right, and South Sudan's President Salva Kiir, left, hold a priest's hands as they pray before signing a peace agreement in Addis Ababa, May 9, 2014. Under the IGAD proposal, there would be one president and three vice presidents. It also proposed 42 ministers and 15 deputy ministers. The position of president would be designated to the Transitional Government of National Unity. The first vice president would be designated to the SPLM-IO led by Machar, and the second and third vice presidents would be designated to the transitional government and other political entities, respectively. The plan also proposes power-sharing ratios in the national government of 55 percent for the transitional government, 25 percent for the SPLM-IO Machar faction, and 20 percent for other political entities. The transitional parliament would be expanded to 440 lawmakers from the current 400. IGAD has proposed various security arrangements for government and rebel forces. Edmond Yakani, an activist delegate at the talks, said the parties have been given a chance to study the document "and tomorrow come and give a proposal." He said there may end up being a shift in percentages in a final power-sharing agreement. Yakani advised citizens back home to "pray hard. At least tomorrow we may have peace prevail."